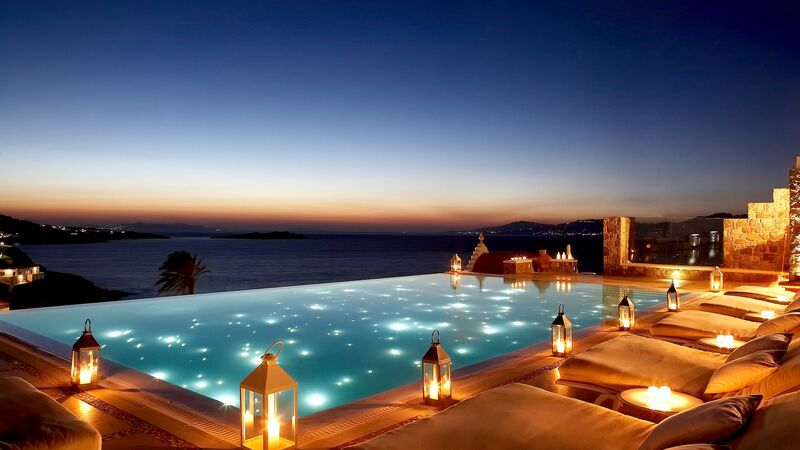 Mykonos Town holidays take you to a sweeping golden bay on the east coast of Mykonos. Wander through the emerald hills, admiring the traditional windmills, before heading into the town. Here you’ll find narrow streets lined with little boutiques and art galleries as well as bars and restaurants. When it comes to dining, Mykonos Town has some excellent options. Choose from lively traditional tavernas and elegant, upmarket choices before stopping off in a bar. The sunsets from the town are spectacular, with the chance to admire them on a sunset cruise or from one of the many restaurants in the town itself. Mykonos Town is packed with little white cubicle houses with coloured doors and balconies full of potted plants, which form a maze with the tiny churches. The intentional twisting footpaths of the town tricked the marauding pirates of centuries ago, but now they are just good fun for visitors who want to explore. If you’re looking to shop, Matoyianni Street is a good place to start, especially for those who love little boutiques and one-off pieces. Among the packed alleyways you’ll find niche boutiques selling the famous handcrafted Mykonos sandals, bespoke costume jewellery, plus a number of designer stores too. After a long day in Matoyianni Street is over, Little Venice is the perfect place to have an evening meal, there are plenty of Bohemian restaurants and chic bars to unwind in. If you want to take a break from shopping you can hop on a small boat to Delos – just 20 minutes away this small island is packed with ancient ruins, where temples used to cover the island, along with theatres, and mansions. Book with Sovereign and you can focus on relaxing while we help you get the most from your luxury holiday in Mykonos Town. Our fantastic selection of hotels has been tried and tested to ensure they have the best facilities and more. Stay at the Bill and Coo Suites for sea views from the infinity pool, traditional architecture, and some of the best sunset views on the island. Enjoy the beautiful sunset across the sea in Little Venice. Perch on a chair and people watch, sipping on your cocktail at one of the cosy cocktail bars (my favourite is Semeli). Transfer time from Mykonos airport to Mykonos Town is approximately 10 minutes.